The rise of edge devices, customer service terminals, digital signage and so on has led to increased demand for embedded processing. Chip maker AMD is expanding its offering in this market with the launch of the new Ryzen Embedded R1000 Series SoC. This offers embedded customers dual core, quad-threaded performance, as well as the ability to run fanless, low power solutions for 4K displays, while providing leading-edge security features. "The AMD Ryzen Embedded R1000 builds out the Ryzen Embedded family and provides a compelling option for customers that want access to the powerful 'Zen' and 'Vega' architecture and are looking for a highly competitive power/performance solution," says Stephen Turnbull, director of product management and business development, Embedded Solutions, AMD. "The Ryzen Embedded R1000 can support rich multimedia environments for digital displays and casino gaming, enterprise class security features for edge computing, networking and thin clients, and, most importantly introduces a new class of performance while providing customers with software and hardware compatibility with the extended Ryzen Embedded family." 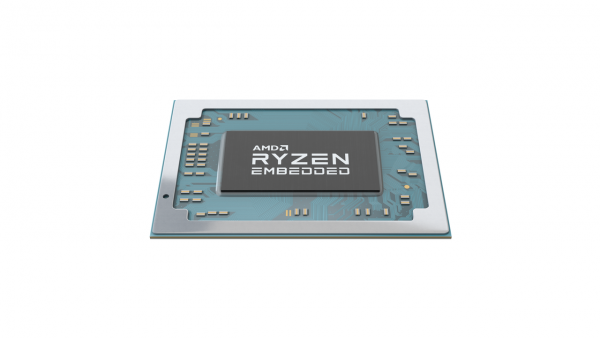 The Ryzen Embedded R1000 uses the same security features as the AMD embedded family, including Secure Root of Trust and Secure Run Technology, giving customers features for enabling secure solutions, whether they are connected into an edge computing network, or running a digital display. Other features include secure boot and memory encryption, dual gigabit Ethernet, 4K encoding/decoding and the ability to support up to three independent 4K displays at up to 60 FPS. More information is available on the AMD website.